Maximize value and minimize risk and costs, fast. Use Minemax Planner as a standalone pit optimizer, or integrate pushback generation and scheduling. Either way, our high-level strategic mine planning and pit optimization software puts a wealth of mine value, mining risk analysis and insights at your fingertips. And it does it fast. See how prices, recoveries, costs and grades affect KPIs/NPV. An independent study by leading mining consultants shows that Minemax Planner creates pit shells faster than Whittle with LG, with identical results. AMC Consultants have released a study report comparing Minemax Planner and GEOVIA Whittle with LG. Planner and Whittle with LG generated exactly the same optimal pit shells with respect to spatial location and pit inventories. The Planner pit optimization computing times were significantly faster than the Whittle pit optimization times, up to several orders of magnitude for the model comprising 9.1 million non-air blocks. Planner efficiently managed and optimized a large model comprising 16.2 million non-air blocks. Whittle was unable to effectively manage a block model of this size, using the test computer (the run was terminated after 40 hours). Gives you the same pit shells as an LG-based optimizer, but in a fraction of the time. Analyze multiple scenarios and make project decisions with less time investment. Combine pit shells into pushbacks automatically, ensuring practicality of subsequent schedules. Quickly determine optimal project value in the context of operational mining and processing constraints. Assess the effect of revenue, cost and recovery variations (using Monte Carlo techniques) and the impact of grade variations on KPIs (conditionally simulated models). Reduces the setup time of your projects and it’s easy to use even for first time planners. Easily handles tens of millions of blocks on computers with sufficient memory, so you can get even more value by optimizing smaller block sizes. Slice and dice through pit shells, pushbacks, and annual face positions for immediate validation of mining practicality. Use instant access charts and tabular reports for rapid analysis of project economics. We offer a range of short-term rental, long-term subscription and perpetual license options. Find out more about the pricing options for the edition that suits you. Contact us for other purchasing options including network licensing, short-term rentals, and perpetual licenses. I don’t have the time or budget for pushbacks, schedules and risk analysis. Can I just generate pit shells? Yes. 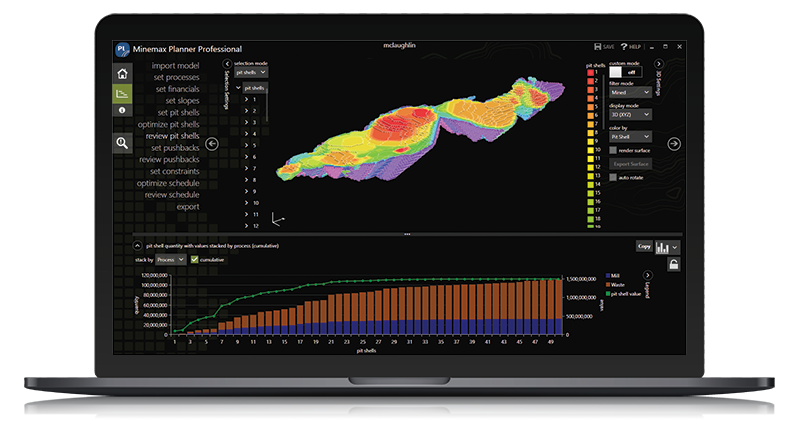 Our high-level strategic mine planning and pit optimization software comes in two editions: Minemax Planner Standard and Minemax Planner Professional. Minemax Planner Standard does pit optimization, nested pit shells and also includes risk analysis at no extra cost. Or you can opt for the Minemax Planner Professional edition, which adds pushback generation and high-level schedule optimization. Does Minemax Planner output strings? Yes. You can easily export pit shells, pushbacks and schedule face positions to csv or dxf file formats for further analysis in almost any third-party product. How does Minemax Planner compare to Whittle with LG, in terms of functionality and speed? Can Minemax Planner handle multi-elements and multi-products/processes? Yes, Minemax Planner can model multiple elements/commodities, as well as multiple products (such as leach-recovered-metal and mill-recovered-metal) in the derivation of revenue for pit optimization and scheduling, making it specific for any open pit bench-mining scenario. How do I feed Minemax Planner’s data into my mine design software? With Minemax Planner, it’s easy to export pit shells, pushbacks or schedule face positions as a dxf for import into any mine design software, so you can view it in three dimensions. The block data can also be exported in csv format, which carries an additional attribute for pit shell #, pushback # and scheduled period, in addition to the standard model fields. Do I need to modify my block model before importing it into Minemax Planner? No. Minemax Planner allows you to directly import your block model without any pre-processing. This is accomplished by using calculated fields with expressions. For example, you can calculate fields such as mining cost based on depth, and recovery as a function of material type and grade. Does Minemax Planner handle rotated models? Yes. Minemax Planner supports importing rotated models, which eliminates the need to manipulate your rotated model before you bring your data into the software. Which Minemax Planner edition is right for you? Make sure you choose the right strategic mine planning and pit optimization software. Contact us for advice on which edition is right for you. See for yourself what Minemax Planner can do. Get in touch to arrange a free demonstration. With Minemax Planner’s guided workflows, you’ll be up and running in no time. But if you have a question, our support team’s here to help.